In our age of hyper-mediated polyphony this will to faith creates its own proofs through the simple repetition of belief. Go to the internet – say it and it is so. The bulletin boards, file sharing nodes and websites that create these proto-theological tropes share the common belief in an unseen force – spiritual, social or organizational that is secretly shaping the world through it’s invisible hand. The Builderberg Group, intervention by angels, the shadow government with its immanent internment camps, 9/11 coverups, chemtrails experiments, terrorist cells, the Illuminati, Skull and Bones, HAARP and Mind control…. the rapture… each scenario builds its particular proofs solely from the interpretation of signs and a communal agreement on their meaning. Again – these signs are hosted in a self referential web of transmedia – existing without a point of clear origination or resolution. Commercial transmedia is itself a response to our polyphonous mediascape – it recognizes that linear, televisual and cinematic forms may also exist in an expanded narrative sense across the internet, games and even physical theatre – where events are staged to augment and encompass television as a subset of more total media practice. The expanded [or we might say persistent] aspect of TV programming like LOST has evolved into a serious development of the televisual producer’s toolkit. Television evolving into transmedia is, however, still generated by the primary text. It’s TV plus – whatever else you might add. The transmedia platform in these instances is still grounded in the agency of the author[s]. Even allowing for “communities” to generate social media artifacts around a program, these are “open” platforms are, in the end still mandated by the imperatives of the production. In contrast, systems of faith are not simply enabled by networked media – they arise and develop spontaneously within the rhizome. As systems of fauth, conspiracy theories find a natural home in the networked world. Without a centre, they rely on lateral accounts, reposts, heresay and conjecture to sustain what are ultimately disseminations of pure credulity. Each point of conjecture repeats, amplifies and evokes the others – perfect simulation. The ongoing belief in the existence of the Illuminati, a shadowy group who wield a kind of invisible power over government, finance and all major forms of social organization, can be factually traced to a short lived society formed in Bavaria from the late 1700s. Despite their brief and undistinguished existence, they rapidly became, after disbanding, a cypher for belief, a springboard beyond logic to the point of simply saying it is so. They are credited, without proof, of secretive control in events ranging from the French Revolution to the formation of the World Bank. Proof of their existence is impossible – it can only be traced to the repetition of belief. As a notion, they morph to fill their role in the cultural imagination – a catch all for any grand narrative of invisible power. A sign with a perpetually floating signified. This belief in unseen power and dark action [a substitute for divine immanence?] is recurrent in modern conspiracy theory. Speculation that the high altitude condensation left behind aircraft on sunny days is in fact a program of tactical chemical release, with a multitude of imagined purposes, can be traced back to William Thomas, a self proclaimed “award winning investigative journalist” who paradoxically specializes in “the news the mainstream media does not want to report”. Having sustained and repeated the unproven and serially debunked proofs of Chemtrails for over a decade, a legion of other “researchers” now repeat these original ideas with religious zeal. Variously taken to be a plot for mass sterilization, population control, weather modification [geoengineering], control of the world’s food supply by Monsanto, mind control through the dissemination of mind altering toxins or more recently, microprocessor enabled smart nanoparticles the size of a single molecule, the all-purpose plot of the chemtrail is a lightning rod for belief in invisible control. So eager are the faithful to proselytize that they sustain the trope on pure instinct. A YouTube channel, whose almost 200 videos are equal parts conspiracy updates and reviews of military clothing and weapons, delivers an update on the phenomena. 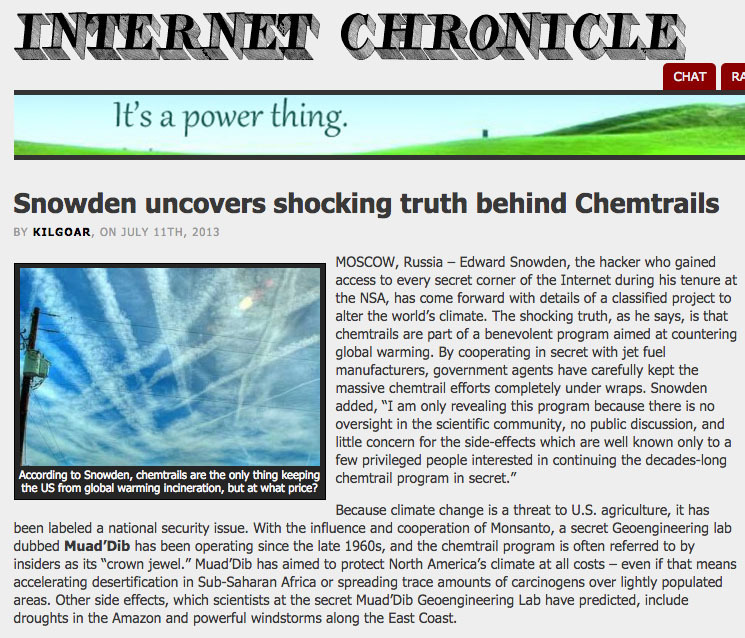 In furthering the story that Edward Snowden was a”hacker who gained access to every secret corner of the internet during his tenure at the NSA” [sic] the report fails to realize that the source was in fact The Internet Chronicle – a satirical website whose headlines include Syria Conflict Causing Retardation in John Kerry and Kim Jong-Un cancels nuclear war, reveals he is K-pop star PSY. Telling it like it is…..[liked by 10]. Faith is circular. Even satire becomes proof, because for the faithful – any reference will always compound and confirm faith. The self-sustaining meme adapts through transmission. Assertion is proof. Denial is proof. Science is a scheme of control to discredit faith. It is an anti-proof. From creationism to chemtrails, the networked echo chamber amplifies the faithful’s capacity for belief in a thousand tiny blooms. The decentered narrative exists in a space of pure transmedia – beyond origin, source or logic. An ecstasy of communication whose efflorescence always falls short of the transcendence it seeks.